The Kingdom Files series includes biography books that explore the lives of people in the Bible. The details in the book provide a vivid location, time, occupation, and hometown visuals while your child explores the character. Within the book, you’ll see a FACT FILE that gives the description, timeline, and other details on the person’s life. The ACTION FILE provides the biblical account via kid-friendly narrative. CLUE BOXES are scattered throughout the text giving your Reading Detective a myriad of thought-provoking details that add more to the story. Finally, the POWER FILE breaks down the lesson and shows how it applies our lives. Matt Koceich provided a vivid and detailed account of Mary’s story. The descriptions used perfectly portrayed her journey through marriage, motherhood, the loss of her son, and his resurrection. Bear and I read through a couple of chapters of this book each morning and discussed what was covered. He liked the author’s attention to detail and how his version lined up when compared to the King James Version of the Bible. Once again Koceich did a good job explaining the story of Jonah and God’s judgment of Ninevah. On page 41 the author wrote, “Whenever God is involved, things don’t always go the way the world thinks they should.” This statement is key to the theme of Jonah’s story, which was full of God-ordained surprises for all involved. Between Jonah’s initial disobedience turned whale encounter to Ninevah’s repentance this Bible story is full of miracles. I liked the life applications mentioned in each CLUE BOX and POWER FILE. I used those as writing prompts for Bear. I would have him explain the story to me, give his thoughts on the point made, and write the memory verse in a spiral notebook. Overall, each book took us about seven school days to work through. We just wanted to take our time and I think it helped us build the discussion. I appreciated the breakdown of various vocabulary and traditions used within the Bible so the children could understand. For example, when lots were being cast the author made time to explain what that meant. Also, when Jesus rebuked Mary his purpose was explained and followed by the importance of his obedience. I was very happy to see the author included the scripture locations throughout each book. This is so important so we can teach our children to read the text themselves. The website also offers four printables you can use to enhance your reading experience. After reading both books, Bear requested another and I did order it. If he is enjoying it then I definitely want to keep using it. The Kingdom Files series, from Barbour Publishing, is suggested for children ages 8 to 12. 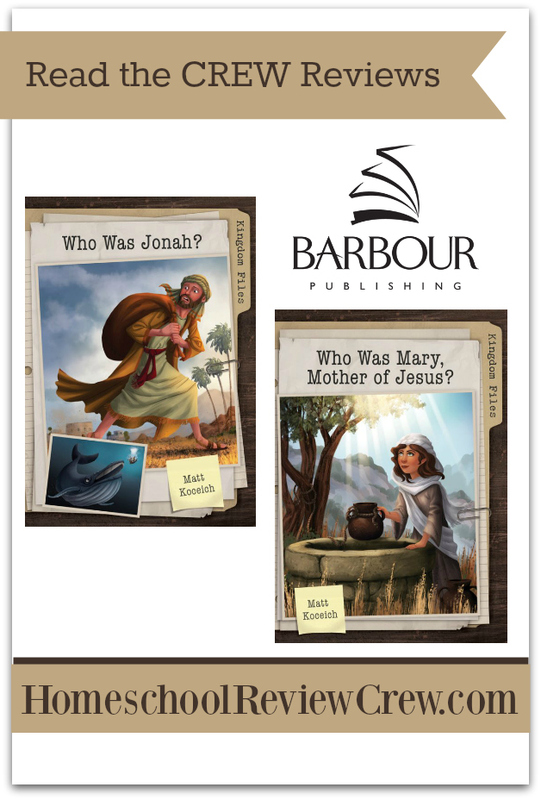 You can purchase Who Was Jonah?, Who Was Mary, Mother of Jesus?, and other titles from this series via various online retailers. Click the photo below to read other Homeschool Review Crew blog posts about these two books.